To encourage people to explore the capital on wheels Santa Cruz council has launched a new bike hire service. 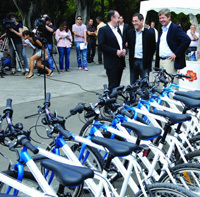 The scheme was unveiled at the García Sanabria Park by Mayor Miguel Zerolo and his deputy Ángel Llanos where the pool of 16 bicycles and four tandems will be based for the next 12 months. The bikes can be hired for just one euro an hour and must be returned back to the Park. The hire service runs on Thursday and Friday afternoons and all day Saturday and Sunday. The council hopes the service, which is being sponsored to the tune of 25,000 euros by a well known food company, will enable visitors to see a different side of the city, not just the pedestrian shopping streets and main buildings, and keep the tourists fit in the process.